Nimli gave me the opportunity to review one of their Azuri Feather Pashmina Shawls. I chose the lime green color. This shawl is very soft and I love the color. I honestly will probably wear it as a scarf in the winter with a cute sweater instead of a shawl (as seen below). The shawl retails for $125 but is on sale on their site for only $34. The company sells many different brands of clothing including men, women's, and children's clothing. Their site has many different cute styles that are quite affordable. Their company also represents a natural, organic, and green lifestyle. I love it! 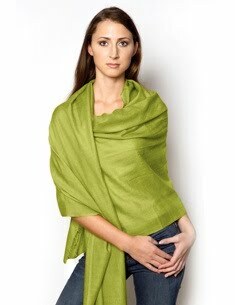 The giveaway will be for one Azuri Feather Pashmina Shawl in the color of your choice (there are 110 colors!!). The giveaway is open until Midnight on Wednesday September 22nd. Winner will be chosen on Thursday September 24th using Random.org. **Please note: the contest is only open to United States readers. Thanks! Tell me which color of Azuri Shawl you would choose if you won! PLEASE MAKE SURE THAT I CAN FIND YOUR EMAIL ADDRESS SOMEWHERE. Also, extra entries must be left as a separate comment. -Like Nimli on Facebook (2 entries). -Subscribe to the Nimli newsletter on the bottom of THIS page (3 entries). -Tell me the ways that you help to save the environment/ be green (1 entry). -Blog about this giveaway (5 entries each time) and leave the link where you did so. -Enter my other current giveaways and let me you did so (1 per other giveaway entry). If I won I would choose the vanilla color. I help save the enviroment by recycling. I entered your Somnio giveaway. I entered your just Argan giveaway. I entered your Ecousable giveaway. I entered your YOuve Been Sentenced BOard game. I entered your Lia Sophia giveaway. I'm attracted to the burnt orange color. I already subscribe to your blog via google reader. I recycle everything I possibly can. I also use the least amount of disposable products as I can. I've also entered your drawing for the ecousable water bottle. I have your blog on the right side of my blog. I use a coffee mug at home and at work, a water bottle and tupperware everyday to avoid throwing away anything that food and drinks need to be stored in! These are absolutely gorgeous!! I would definately choose aqua. I follow you in Google. What a stunning color and shawl! Thank you for stopping by my blog. I am now following you. I think I would choose Plum, but I could keep looking at the colors for hours. Love the azalea and peacock colors. I would get the black one. Not only is it gorgeous, but I can wear it with anything!! Another way I help save the environment is using the energy efficient light bulbs! I'd choose the same lime color you did. I would choose the Vanilla color. To be green: I use cloth diapers, cloth wipes, reusable containers and cloth napkins. I help the environment by recycling at home and work. I entered the water bottle giveaway. Oh, I would choose Chocolate! I love brown! I entered Oak Ridge giveaway! I entered for the shaper tights-yea, one step closer to a shawl! I entered for the soy candles which look lovely and would make great gifts too! Subscribed at the bottom of the page=3 entries, this is the final one. Silvery grey shawl please! I am your follower. I would chose the peacock color. second entry- ways I help the enviroment- I RECYCLE. I am big on recycling. I like the pink lilac.